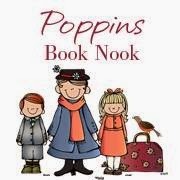 Welcome to the second edition of Poppin's Book Nook! Our theme this month was Wizards. To be honest, I couldn't think of many Wizard books for my kids age right away. Then one of the girls happened to come across Joe-Joe the Wizard Brews up Solids, Liquids, and Gases at the library. It is a cute little book about a young wizard that doesn't enjoy his "plain old science" class. It also happens to teach States of Matter, something the girls needed to learn more about. 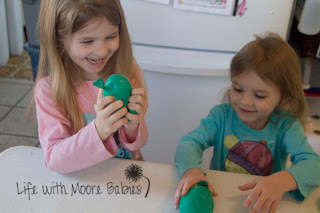 So the girls got to learn about states of matter along with Joe-Joe. 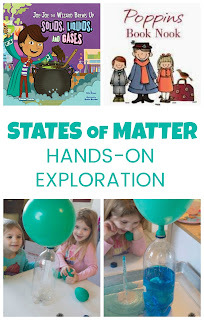 We started by exploring balloons filled with different states of matter: one with air, one with water, and one with ice. 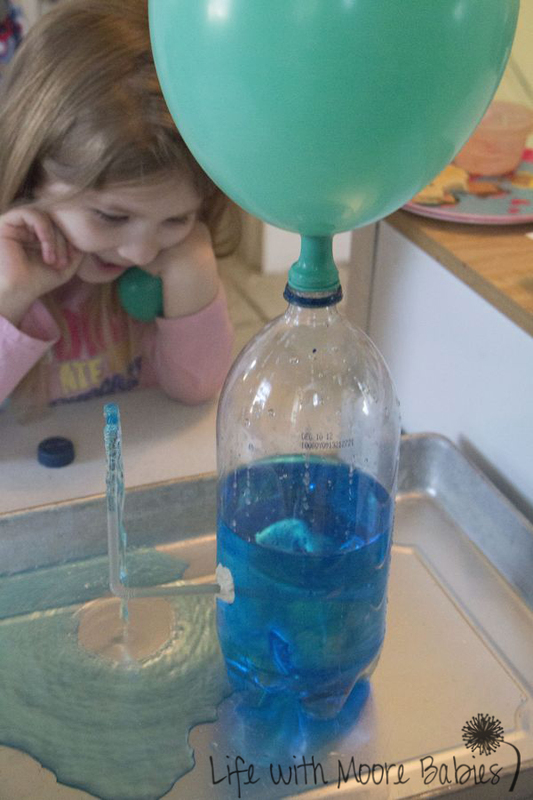 The quickly realized the water filled balloon and the air filled balloon could be squished into different states while the ice filled one couldn't. After playing with the balloons it seemed obvious that the girls didn't really believe a gas took up space (because they couldn't see it), so I borrowed this fun DIY Water Fountain from Learn with Play at Home! You start with a balloon and an empty bottle. Ask you kids what is in the bottle (correct answer = gas). 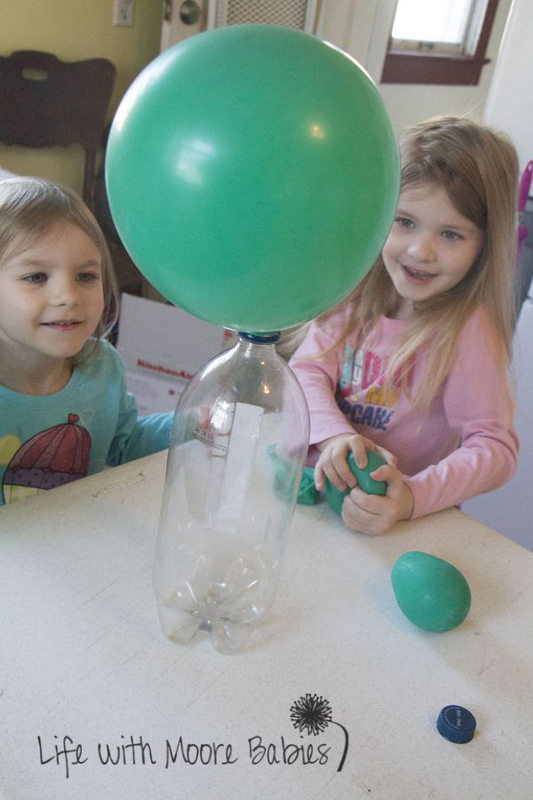 Then blow up the balloon and ask what is in it (again the correct answer = gas). 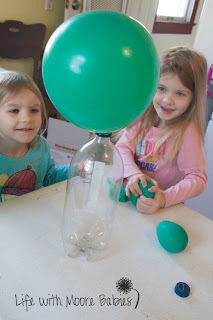 Ask what will happen when the balloon is put on the bottle. They make think the balloon will go down because it is now open, but it doesn't! Why? Because the bottle was already full of gas! 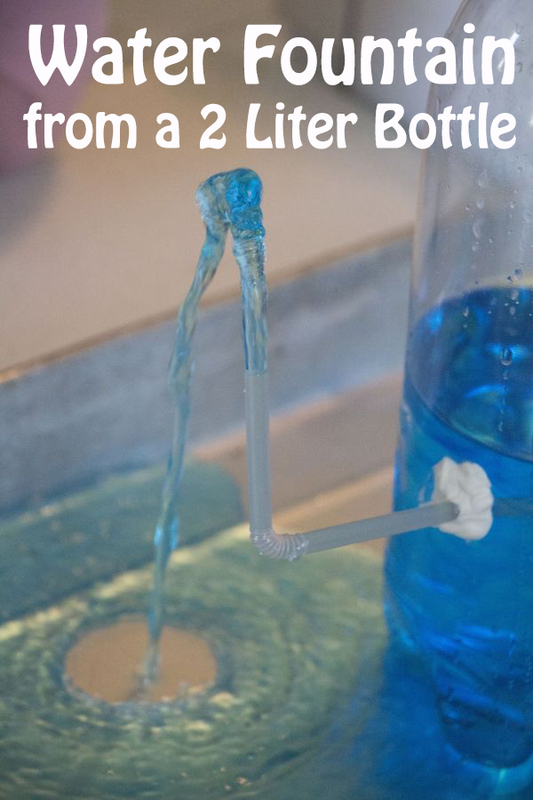 The second part of this experiment also show how gas takes up space and how both liquids and gases will flow and change shape. Again you need a bottle (we used a 2 liter), as well as a bendy straw, and something to seal the hole (we used liquid nails because I couldn't locate my hot glue gun *gasp*). 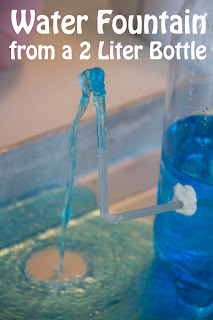 Make a small hole in the bottle and slide the straw in. Seal the hole. Then (with the straw facing up), fill the bottle even with the top of the straw. 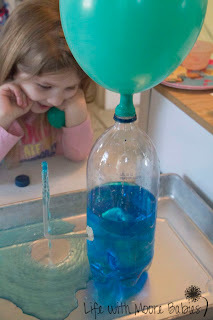 Now (with your bottle sitting in a pan), blow up a balloon and put it on top of the bottle. 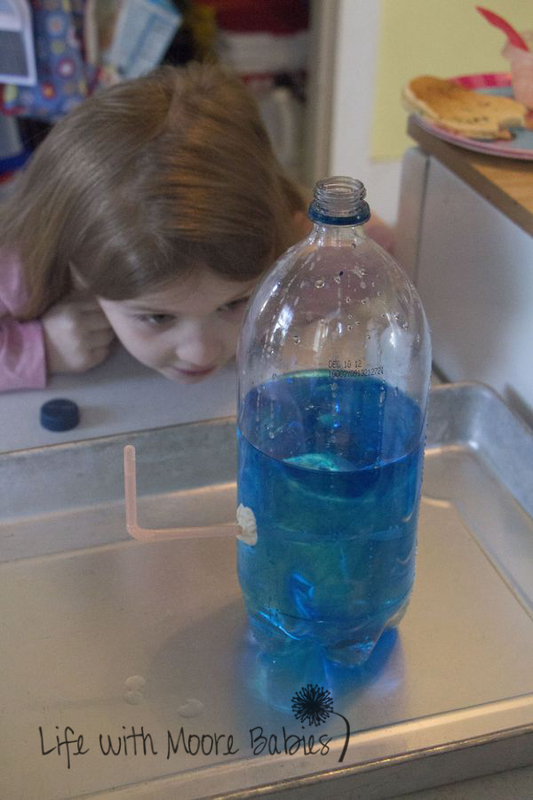 Be amazed as the air in the balloon pushes the water out through the straw! And repeat, over and over and over! 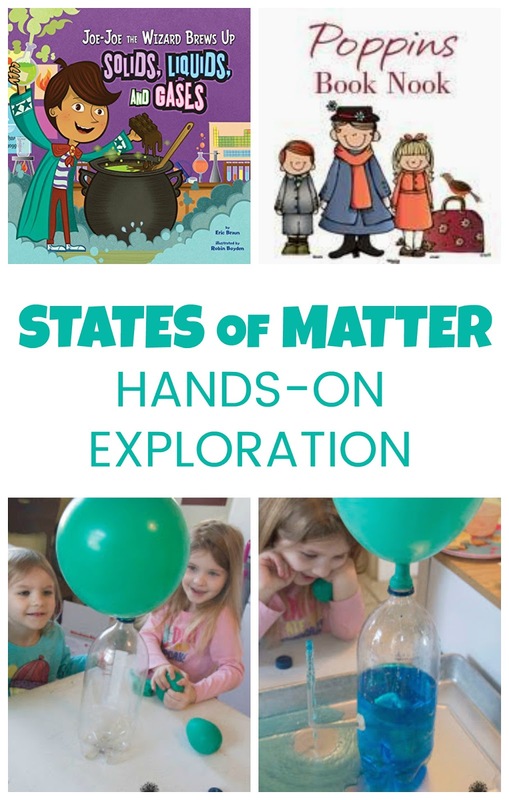 We may not have made "chocolate gas" like Joe-Joe, but we did have a lot of fun playing with states of matter. Make sure you visit all the other participating blogs to see what Wonderful Wizard Fun they had this month! Then come back and link up your Wizard fun too! Next month we are headed way into the past with Dinosaurs!